Identical in layout and construction to my previous Haithabu serk is the kirtle sewn according to below thesis and instructions. I chose to turn to the Haithabu findings for two reasons. Firstly, Haithabu’s the second major excavation site dating back to the Viking Age apart from Birka. Secondly, the Haithabu fragments show evidence that the garments weren’t just combining the classical geometrical shapes, but composed of advanced tailoring techniques, where several of the pieces have been cut into shapes that closely follow the body. The wool garment pieces display rounded armholes for fitted sleeves, two-piece body construction with shoulder seams and scoop-style necklines (Hägg, 1974, p. 171). Having sewn the classical panel kirtle before, I thought I’d might give this a go. Many of the wool fragments found in Haithabu were dyed brown using walnut (Hägg, 1984, p. 289). Since I’m not (yet) acquainted with plant dying raw fabrics I purchased an artificially pre-dyed tabby woven wool with a rather structured and burled surface. Fragment 57 (identified to belong to an over tunic) from the harbour shows that at least the sleeves of the tunic had a fitted shape that followed the curved armholes of the garment’s body, instead of the regular rectangle or trapezium shaped sleeves. 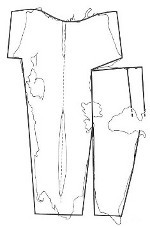 The sleeve is made up of three pieces; A, B and C, and shows evidence that not all clothing items were made of fabric in a single coloring as piece A and B were dyed in a darker shade than piece C. The circumference of the sleeve varies from 21 cm at its narrowest to 29 cm at its widest. As for the length of the garment; one can only argue whether women wore over clothing that reached below the hip. Hägg suggests, however, that fragment 6A and 6B, the 30 cm and 81 cm long strips of woolen twill that were found in the harbour, come from a floor length over tunic which would, if determined a correct interpretation, be rare archaeological evidence of women’s clothing actually reaching below their hips. Fragment S29 from the harbour is a woolen twill gore, 43 cm long and 19 cm at its widest. Being torn at the bottom its original length is impossible to determine. The sides show traces of having been folded in approx. 15 mm and stitched to adjacent pieces on either side. When analyzed together with fragment 55A; it’s evident that gores were used to widen a garment. Fragment 55A is from the bottom of a tunic, is 31 cm long, 16 cm wide at the top and 37 cm wide at the bottom. It, too, is torn at the bottom and torn (or cut) at waist level. The fragment is pieced together from five separate smaller pieces; one tiny fragment, two four-sided pieces that widen towards the bottom, flanked by two gores. My kirtle is made up of a front and a back panel, sewn together at the shoulders and each split in the middle by a gore of 50 cm at its widest. The panels are stitched to trapezium shaped gores (20 cm at the top and 50 cm at the widest) that start in the armpits. The sleeves are replicas of fragment 57, except that all pieces (A, B and C) are the same color. The circumference of my sleeves wary between 50 cm and 15 cm. To add aesthetic detail the lower hem is trimmed with silk. Please feel free to use this downloadable Haithabu kirtle tutorial.